The Volvo truck plant in Dublin has recently added 200 jobs. 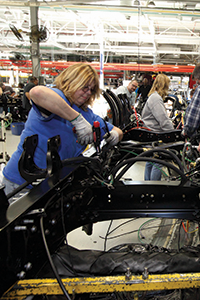 Buoyed by a resurgent manufacturing sector, Southwest Virginia continued to ride the nation’s economic upswing in 2014. Numerous longstanding employers announced expansions from the Roanoke Valley down through the New River Valley and farther southwest, while two localities on the Blue Ridge Plateau — Carroll County and Grayson County — saw new businesses fill spots left vacant by previous occupants. The growth filled vacant industrial land tracts and spurred Roanoke Valley governments to form the Western Virginia Industrial Facility Authority to find new potential economic development sites. A longer-running collaborative effort — the 13-locality Virginia’s First Regional Industrial Facilities Authority, which operates the New River Valley Commerce Park — saw its first tenant open its doors and begin production, with Red Sun Farms growing 18 acres of organic and hydroponic tomatoes under greenhouse glass. Other projects announced in 2013, including Korona Candles and Falls Stamp and Welding in Pulaski County, Virginia Transformer in Roanoke and Ardagh Group in Roanoke County, also began production last year. Roughly three-quarters of job growth nationally tends to come from expansions by existing companies, and that rule of thumb fit the Roanoke and New River valleys last year. Consider Altec Industries. The Birmingham, Ala.-based company makes aerial devices for bucket trucks, cranes and digger derricks at a plant in Botetourt County. “Once I became familiar with their name, now if I’m going down the road and see a bucket truck for Appalachian or whoever, it’s almost always an Altec truck,” says Beth Doughty, executive director for the Roanoke Regional Partnership. Similarly, Volvo Trucks added 200 jobs this year at its Pulaski County plant as the company ramped up production. The company also collaborated with its workers union, United Auto Workers Local 2069, to identify and use in-house talent to design and build a customer experience track. The dogbane-shaped, 1.1-mile paved loop wraps around storm water ponds and an off-road path, allowing potential buyers and visitors without commercial driver’s licenses to test long-haul and off-road trucks in simulated real-life conditions. At least two expansions saw existing companies in one locality open new operations centers in a neighboring locality. Alexander Industries, which since 2001 has built specialized rifles, cartridges and accessories at the Radford Army Ammunition Plant for use by military, law enforcement and civilian customers, is building a new, 25,000-square-foot facility in Dublin Industrial Park in Pulaski County. The expansion allows the company to move from a “build-to-order” to a “build-to-sell” business model, meaning that company officials will seek out new domestic and international markets. Farther southwest, Mayville Engineering Co. Inc. (MEC) in Wytheville announced it would invest $10 million to expand into a new manufacturing facility in the former Merillat plant in Smyth County. MEC fabricates metal products for agricultural, commercial vehicle, construction, forestry, on/off road power sports, energy, military and industrial markets. The company has seen growth in demand from new and existing contracts. The Smyth County Board of Supervisors voted in December, four months after the MEC deal was announced, to withdraw funding and disaffiliate with Virginia’s aCorridor. Still, the regional partnership saw major deals announced in two of its affiliate members, Carroll County and Grayson County, both of which sit atop the Blue Ridge Plateau. Vanguard Furniture, a high-end, made-to-order furniture upholstery maker with five manufacturing buildings in Conover, N.C., and a showroom in High Point, N.C., announced it would open a new production operation in the former Parkdale Mills site in the Carroll County Industrial Park, creating 200 jobs. In Grayson County, Core Health & Fitness said it would take over the former Med-Fit operation, which in various forms had manufactured Nautilus fitness machines for nearly 40 years. The reopened facility added brand lines that previously had been produced in China, creating a total of 250 jobs. The increased employment allowed the plant to retake its spot as the county’s top employer. Pulaski County continued to assert strength as a regional destination for manufacturing. The NRV Commerce Park is located there, and four of the year’s top job-producing deals, including the Volvo and Alexander Industries expansions, happened in Pulaski County. Additionally, MTM Inc., a medical and transportation management company, and James Hardie Building Products Inc., which makes fiber-cement siding for the construction industry, announced expansions in Pulaski, creating 66 and 69 jobs, respectively. Chalk up the county’s success during the past couple of years to a combination of offering a key location with access to rail, interstate highways and natural gas; plenty of still-vacant industrial land; a cooperative pro-business attitude from local government; and positive movement in the national economy, says Pulaski County Administrator Pete Huber. While Pulaski County still has remaining room in the NRV Commerce Park — a 1,000-acre property is planned for sites 75 acres or larger, with the anticipation of hosting up to five businesses of that size — other localities are rapidly running short of inventory. Doughty cited similar problems in the Roanoke region but also expressed hope in the creation of the Western Virginia Industrial Facility Authority, designed to identify possible Roanoke Valley economic development sites and give its governments more flexibility to strike agreements and work together to lure large industry.